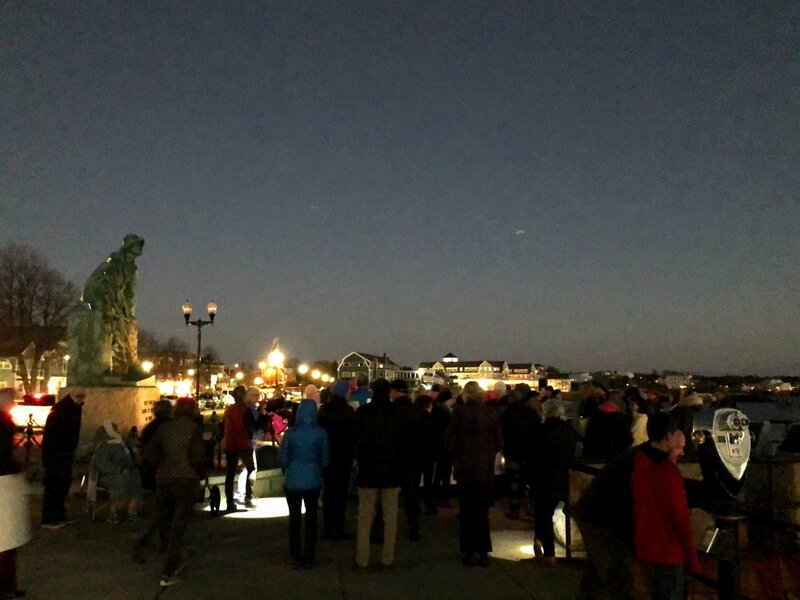 I walked toward the “Protect Mueller” rally in Gloucester, MA on Thursday night inwardly confused. Was I there to protest or celebrate? The Midterm Elections results were still not complete, but our party had just voted more Democrats into Congress than any time since Watergate. We had just watched as Americans, from Congressional district to shining Congressional district, said “no” to Donald Trump’s and the Republican party’s two year sneer at immigrants, at dark-skinned people, at the environment, at anything but themselves and their freshly flush bank accounts. And yet, I was outraged like all of us by Trump’s wretched move to replace Jeff Sessions with Matt Whittaker. Tuesday’s elections results had broadcast to the president a whole new level of personal danger, so, as is typical, he went running for cover. Trump crossed the red line we had been imagining ever since the image of long-faced Robert Mueller walking hallways carrying bundles of files became our vision of hope. The Facebook orders said find your place. 5:00 Tuesday night. Hit the streets. Protest. No one is above the law. Here comes the constitutional crisis. But there is argument, and I know because I embodied the confusion, that Trump made this move precisely to mix-up America, literally to have us asking, “Do I protest or celebrate?” Will this choleric AG move over-shadow the Midterm Election wins? - or maybe it’s the other way around - maybe we will be so busy winning we won’t notice Trump’s gross disrespect for rule of law? Our local protest was assigned to meet at Gloucester’s iconic “Man at the Wheel” statue which stands on a half-mile pedestrian walk along the harbor. The view here is south-south-west to the harbor opening. It’s easy to imagine fleets of schooners rounding the bend, the relief families once felt seeing those ships come home, knowing everyone was safe and there was probably a hold full of fish and therefore bills would be paid. We were maybe fifty people huddled in growing darkness underneath the sturdy statue of the intrepid Sou’westered sea captain leaning into a gale, his hands gripping the ship’s wheel with prowess and conviction, the hero we all want to know if not be. Our leader was a woman reading with a flashlight from a ruffled Indivisible script. Our repeated refrain together was “No one is above the law! Trump is not above the law!” but her voice was soft, and our echoes were short on potency. Someone started to sing, “This Little Light of Mine,” and then “We Shall Overcome,” but both sounded deficient. We HAD just overcome. The light in so many congressional districts, governors seats, state legislatures DID shine. I could see through the wooly-hatted crowd the man was seated uncomfortably close to our leader at the foot of the statue. He was probably in his late 70’s or early 80’s even. His face, illuminated by the crowd’s flashlights, was long, pale and ragged, maybe scarred, an older version of the sea captain leaning over us. He was bellowing out hatred from beneath a bright red cap, which I assumed was a MAGA hat, but saw later it was the Patriots. His voice was so strong and determined, you could feel tension traveling around the statue, and fear. Someone must have asked him to move, maybe touched him, because he bellowed over all the other muffled voices “DON’T TOUCH ME! I JUST HAD HEART SURGERY!” Then I could hear the people on that side saying “just ignore him, ignore him.” After a little scuffling which I couldn’t see, the woman returned to reading from the papers, and the bellowing ended. When our facilitator finished reading, and we finished echoing our parts that no one was above the law, there was nothing left to do. We had only been there for twenty minutes. The woman with the papers then suggested that we all turn to the people beside us, and greet them, get to know our fellow protestors, that thing I dread. Who knows why, but the people on both sides of me turned to their other sides. I had no one to greet. So I headed for that guy. He wasn’t alone. Another woman had already found him, and was talking to him. He was sort of backed against the fencing, as if to hold himself up. She was tall and reedy with a short haircut and architectural-looking glasses. They seemed to have been talking for a while when I approached. His expression was relaxed and his voice was completely conversational, soft even, but he stiffened at my arrival, as if he was remembering to bellow and be mean. And soon we were having a good conversation in the darkness along Gloucester Harbor. Joe - his name is Joe - believes we all need better health care. He believes we need the immigrants who are coming here to work, but they need to come legally, and we need to fix that. He really doesn’t like Bill Clinton. When we touched on the Clintons things got irrational again; Joe believes Bill Clinton raped a woman and Trump didn’t. Then another woman came up to us through the darkness, “Joe! What are you doing here! Are you making trouble?” The woman had been in the protest, and had just recognized Joe. “He lives right across the street, you know,” she told us. “He comes over here whenever there’s something like this. He just likes to stir everyone up.” Joe chuckled. “How’s your wife doing?” she asked him. “Not good,” he said, looking away. “Old. My kids are old; I’m a great- grandfather! I’m OLD!” Joe was sad about sickness and about growing old. “He’s a retired cop, you know,” the woman told us, maybe trying to change the subject, and then she teased, “Joe, don’t tell Ringo I’m here!” Ringo is Ringo Tarr. The Tarrs have been Republicans on Cape Ann almost since the island was settled by the English. Suddenly, this whole thing - this meeting of people beneath the Man At The Wheel - was as local as breakfast at George’s. Suddenly people knew each other as friends, as characters, as retired cops. The air deflated out of this rally. My daughter called. I stepped away to talk to her, and then I went off to the “Taste of Cape Ann” event to benefit the YMCA. Of course, it’s easy to find a happy ending when your party has just succeeded, but I really don’t see this as a Democratic win; I see it as America’s win. Donald Trump - whatever Joe wants to say because he needs to provoke us, because we are in his front yard, and he’s sad about his wife - doesn’t care about America. But I’m really glad Joe and I had a chance to talk that night. In honor of the Man at the Wheel, I offer a favorite chowder recipe. Put all ingredients except cream into a 6 quart casserole. Cover and bake at 375 degrees F. for 1 hour. Heat cream to scalding, and stir into chowder, while gently breaking up the fish. Serve immediately in warm bowls garnished with fresh dill if you like.